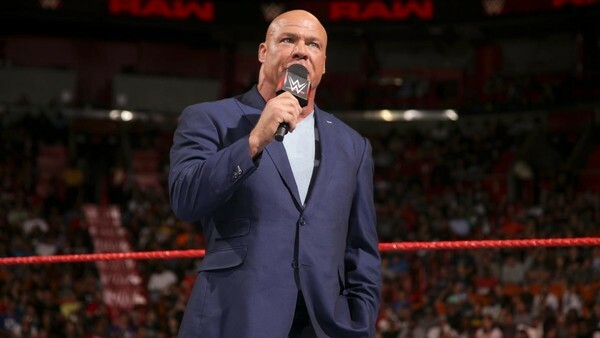 Kurt Angle is taking time off from being the General Manager of Monday Night RAW to train for his next WWE match, according to PWInsider. The 49-year-old has been GM ever since the RAW after WrestleMania 33, but on this week's TV was sent on an enforced holiday by Commissioner Stephanie McMahon, and replaced by Constable Baron Corbin. "It could be that this is the beginning of that storyline to bring him back to the wrestling ring. So either to move him temporarily from General Manager or remove him completely from the GM role and have him wrestle every now and again." The former world champion has regularly repeated his desire to return to the ring, and this news will spark speculation on who he could face. Allegedly, there are plans for Angle to compete at October's WWE Super Show-Down pay-per-view in Melbourne, Australia. Other potential match-ups could see Team Angle versus Team Corbin at November's Survivor Series PPV, a father-son feud with Jason Jordan, or even the wrestling machine reigniting his old rivalry with Brock Lesnar, especially as Angle refused Lesnar a Universal Championship rematch at Hell in a Cell. Whatever happens, it appears that it won't be long until we see that star-spangled singlet back in a WWE ring.